Southern Districts Football Club (Official)- The official site of the South District Crocs of Darwn, Northern Territory. Central District Football Club Web Site (Official) - "We are in the South Australian National Football League. The club is based in Elizabeth, a city just north of the capital of South Australia - Adelaide. We are known as the Bulldogs, Dogs or Doggies." SANFL - The South Australian National Football League (SANFL) is the local, Adelaide-based, Football League. AFL Players' Association- The representative body for all AFL players. AustralianRulesFootball.com.au - If it's not Aussie Rules, it's a waste of time! Talking Footy - AFL news, fixtures, teams, injury reports, results, ladder, tv times, tickets, merchandise, tipping competitions, forums and more. Discuss all footy codes with other fans who love the game! Darryl Harvey's Footy Page - A wealth of information and links. 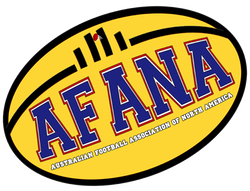 One of the longer standing Footy Web sites in Australia, and a supporter of AFANA. Includes Footy Tipping Software. Footy Banter Team - "A group of witty individuals who congregate to discuss the intricate and/or humorous historical and contemporary aspects of Australian Rules Football." Check out "Leachy's Weird Footy Facts". Footy Jumpers - Every guernsey ever worn and every logo ever used by all VFL/AFL clubs (including University). Internet Fantasy Footy - Two competition styles centering primarily around goalkicking plus a FREE tipping competition! Overseas coaches particularly welcome! Mat Thompson's Footy Web Site - A new and improving footy website from the land of footy, Australia. Mollyzine AFL Podcast - A site with a weekly AFL Podcast from Melbourne. Simulated League Football - Select your favorites and have them score goals for your club in a premiership league of your own played over the Internet. Play weekly against 9 other managers from worldwide. Invent your club's home ground, guernsey, sponsor etc. etc. State Library of Victoria - Interested in the history of Australian football? Then you'll want to visit this site. Victorian Football Umpires Association - AFL Umpires of the world UNITE. ABC- ABC has a netcast and other footy things. 3AW- 3AW's netcast and footy news section. Footy Forecaster- Forecasts, predictions and ratings for AFL matches as well as sensationally geeky ratings graphs. AussieSportsInfo - A site with lots of info on various Aussie sports and leagues. Australians Abroad is a source for information, articles, news, and links for the Australian far from home. Homesick Australia- the site for homesick Australians overseas. We want more links! If you're a webmaster of a footy site somewhere and you're not in our Australian list of links, drop us a line and we'll put you in our links. Please include some information about your site to go with your link.